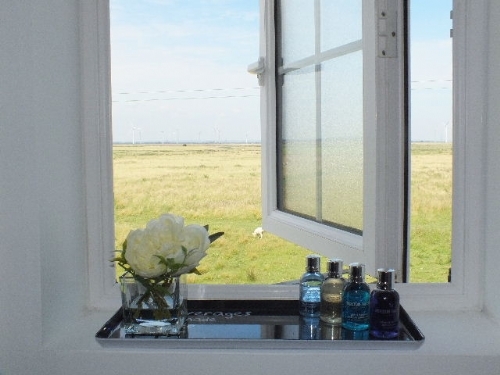 The Peninsula is a 4 Star, Gold Award, self catering holiday cottage in Sussex, within five minutes walk of the most wonderful sandy beach of Camber Sands, a perfect family holiday destination. This cottage has been interior designed and exquisitely finished with spectacular uninterrupted views over the surrounding nature conservation farmland. The spacious, light and sunny kitchen and dinning room is bathed in natural sunlight. French doors lead from the spacious lounge area into the fully enclosed garden of the Sussex holiday cottage. A special feature of this cottage is the one mile uninterrupted views over natural reservation area from its private garden, along with the beautiful outdoor furniture and barbeque, make it the perfect place to sit and enjoy a chilled glass of wine after a day at the beach. The contemporary feel continues throughout the coastal holiday cottage in Sussex with stunning sofas and armchairs in the elegant sitting room. 37" inch HD TV and electrical fire place completes the modern look. Two 32" flat screen TVs are fitted in both master bedroom and guest room. Upstairs all the rooms are spacious; particularly the master bedroom has the feeling of an elegant hotel with is purple and black decoration. Crisp Egyptian cotton bed linen on all the beds! The family bathroom and en-suite shower room is decorated with striking Brazilian river slate tiles which reflects a lovely feel throughout. Crisp cotton bed linen on all the beds! The Peninsula is one of the most baby and children friendly holiday cottages in Camber, it is fully equipped with cot bed, high chair, dining booster seat, play mats, baby Moses basket, child chairs and table, as well as scooter, puzzles, beach and garden toys. All in all, this Sussex holiday cottage is an airy holiday cottage in a great location, with all the mod cons you could desire to make your stay in Sussex a memorable one. The Peninsula: sleeps 6 in 3 bedrooms, one with ensuite shower room, 1 reception room, 1 family bathroom. Fully enclosed patio garden and parking. The kitchen/dining room is very well equipped with washer/dryer, dishwasher, fridge/freezer, extractor fan, double electric oven and hob,microwave, Philips Senseo coffee machine. Ther dining area seats 6 at the table. Sitting room with stylish electric fire, sofas with 37" flat screen TV and multi-region DVD player as well as a selection of DVD's. Private decked outside area with stunning unobstructed views with seating and barbeque. A side gate leads to the parking area, with dedicated space for one car available in front of the garage. Further parking is available on the road. Gas central heating, the house is fully protected by alarm and fire detection system. The whole family will love a visit to the International GoKarting at Lydd, just a short drive away. Days on the beach take centre stage, bring the bucket and spade.